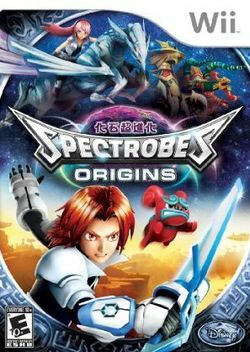 Spectrobes: Origins (化石超進化 スペクトロブス：オリジンズ, Kaseki Chōshinka Supekutorobusu: Orignsu?, Fossil Super-Evolution Spectrobes: Origins) is an action RPG video game developed by Genki and published by Disney Interactive Studios and is the third entry in the Spectrobes series. It is the first Spectrobes game in the series to be developed by Genki and to be exclusive for the Wii. The game was released in the US in August 18, 2009 followed by the European release on September 18, 2009 and an Australian release on October 4, 2009. Rallen and Jeena get sent through a portal which leads them to another star system which is being invaded by a massive army of Krawl. They must use the cosmolink (an ancient device for summoning Spectrobes) to defeat the Krawl leader Krux and bring peace to the star system. Spectrobes: Origins gameplay features the unique Wii controls to explore vast worlds, excavate three-dimensional fossils and unravel an engaging story while discovering the key to preventing a galactic threat. While immersed in the universe as never before, players will fight enemies by controlling planetary patrol officers Rallen and Jeena with a Spectrobe creature at their side in large-scale, real-time battles. The game has free roam and multiple planets to explore. This page was last edited on 5 April 2010, at 18:12.